GRAND RAPIDS, Mich. – More than 300 SpartanNash associates recently spent the day giving back to their local communities during the company’s third annual Helping Hands Day – a day of community service benefitting 24 nonprofit organizations throughout West Michigan. In total, SpartanNash associates volunteered a combined 2,500 hours during the Helping Hands Day on June 14, resulting in $60,350 in economic impact*. Groups of SpartanNash associates spent the day mulching trails at Blandford Nature Center; landscaping and property improvement at Guiding Light, Baxter Community Center and Well House; building homes at two Habitat for Humanity sites; preparing meals at Hope Lodge and Meals on Wheels West Michigan; and sorting donations at In the Image, among other tasks. SpartanNash continues to increase its commitment to volunteerism, challenging its associates from across the country to collectively give 60,000 hours of their time to volunteer efforts in 2018. Associates are encouraged to find the causes that they are most passionate about and volunteer in their local communities. So far in 2018, SpartanNash associates have collectively volunteered nearly 16,000 hours. 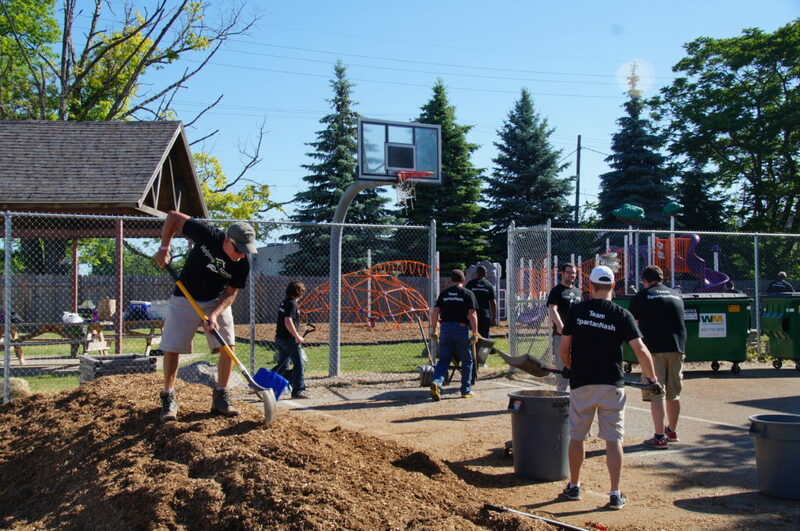 More than half of all SpartanNash associates who work at the company’s corporate headquarters in Grand Rapids, Mich. participated in the Helping Hands Day. In addition to the volunteer efforts, the SpartanNash Foundation – the company’s charitable giving arm – also supports many of its Helping Hands Day nonprofit partners through its retail fundraising campaigns and grant donations. SpartanNash is the nation’s fifth-largest food distributor, with more than 140 retail grocery stores in eight states – including 87 Family Fare, D&W Fresh Market, ValuLand and VG’s stores throughout Michigan – and independent retail customers across the country. The company is also a leading distributor of grocery products to U.S military commissaries. The inaugural Helping Hands in the Community Day took place when associates from the SpartanNash’s Minneapolis location spent a day volunteering together in June 2011. Since then, SpartanNash associates have participated annually, contributing nearly 25,000 hours and $603,000 in economic impact*. To learn more about SpartanNash’s commitment to volunteering, visit spartannash.com/volunteer. *Based on Independent Sector estimate from U.S. Bureau of Labor Statistics.